The "Queen of the Parasites" deserves a photo gallery page devoted just to her! Click on the Thumbnails to see descriptions and larger phototographs of these species. Part of R. cantleyi complex. 5. Rafflesia bengkuluensis Susatya et al. 13. 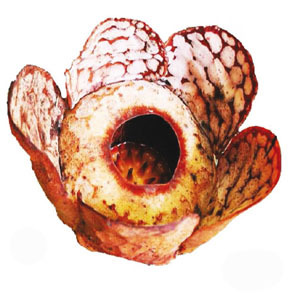 Rafflesia lawangensis Mat-Salleh et al. 20. Rafflesia mixta Barcelona et al. 24. Rafflesia rochussenii Teijsm. & Binnend. 29. Rafflesia verrucosa Balete et al. Collected only once (1917); material incomplete. Collected in 1918, possibly 1957. Rafflesia parvimaculata Sofiyanti et al. 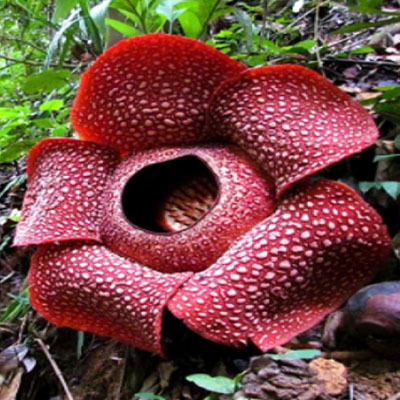 Rafflesia sharifah-hapsahiae Haji Adam et al. 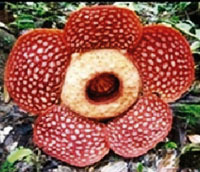 Rafflesia tuanku-halimii Haji Adam et al. Described from only a bud, incomplete material exists to determine if it's a distinct species. Similar to R. pricei.